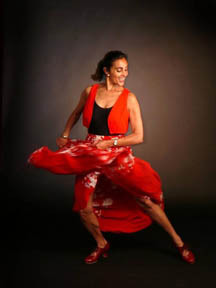 A fiery and fun workout, Flamenco Fitness will get your heart thumping! In addition to cardio, you’ll strengthen your arms, legs, feet, and torso. Footwork, skirt work, palmas and arm work from the Spanish gypsy tradition will make this a workout like no other. You’ll even play castanets. So ignite some flamenco fire in your soul and stamp it up a notch! Please wear pants you can stretch in for the warm ups and bring a skirt for the skirt work. Wear closed-toe shoes with low heels.